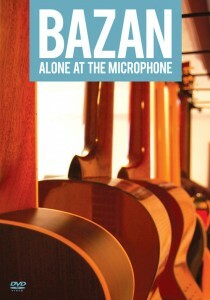 Alone at the Microphone features David Bazan playing some of his favorite Pedro the Lion, Headphones, and Bazan solo songs in his home studio plus candid interviews about songwriting, family, playing live, love songs and more. Filmed in and around Seattle Washington: Summer 2008. Audio for performances recorded live during filming. 48k/16 bit into LIVE 5.0 running on an Apple PowerMac G5. Vocals: Shure SM58 + D.W. Fearn tube pre-amp + Apogee Duet interface. Acoustic guitars: Larrivee L-O3 + Oktava Mod MK-219 + D.W. Fearn Tube Mic pre-amp + Apogee Duet. Little Martin + RODE Video mic direct to Canon HV30. Classical guitar: Fancisco Student Classical + Oktava Mod MK-219 + D.W. Fearn Tube Mic pre-amp + Apogee Duet. Electric Guitar: Epiphone Dot with Lollar Humbucker pickups. Guitar amp: 60s Gibson Discoverer tube amp + Shure SM57 + D.W. Fearn Tube Mic pre-amp + Apogee Duet. Piano: Kurtzmann full upright grand + Octava Mod MK-219 + D.W. Fearn Tube Mic pre + Apogee Duet. Looping: Boss RC-20 Loop Station + Shure SM57 + Gibson amp + Oktava Mod MK-219. Audio for interviews: RODE Video Mic or Audio Technica Lavalier Mic. NTSC / Region 1. The DVD should play in all modern DVD players sold in North America. We have not tested with PAL or other regions. We cannot guarantee the playability in DVD players sold outside of North America. Printed on 100% recycled paper using eco-friendly vegeatable-based inks. Nikon D50 with a 50mm 1.4f lens. Grady Highberry, Caleb Palma, David Bazan. Jared Hankins for the D.W. Fearn tube pre-amp. Adam Klavohn for the Apogee Duet Interface.